Laurie’s front porch is a clear indicator of what you’ll see once you cross the threshold. Lots of romance, ruffles, flowers, and plenty of white! If you didn’t know better, you’d think you just stepped into Rachel Ashwell’s home (she’s the creator of the much-famed shabby chic style). 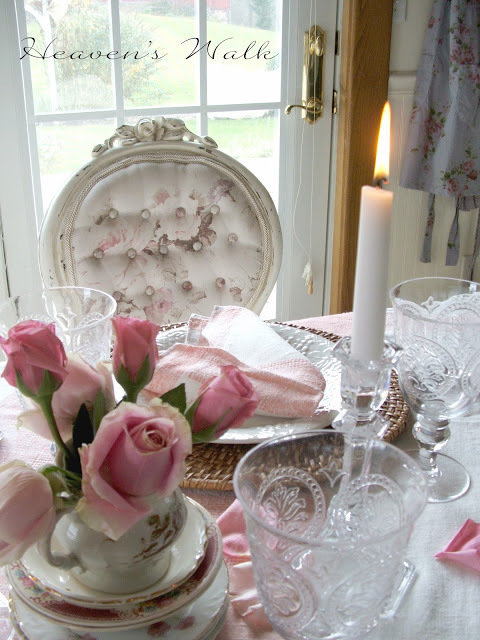 Ruffles and wicker grace Laurie’s shabby chic farm house lending a sweet essence to her dining room. You’ll glimpse touches of French persuasion throughout her home. 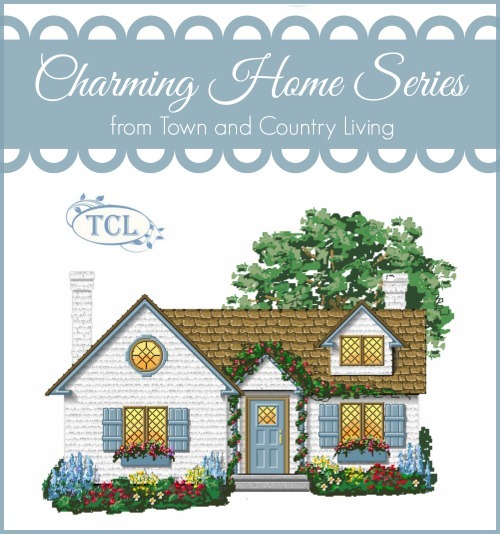 Laurie infuses an enchanting and delicate romance into every room. Even farm fresh cherry pies get served on a soft back drop of delicate flowers. 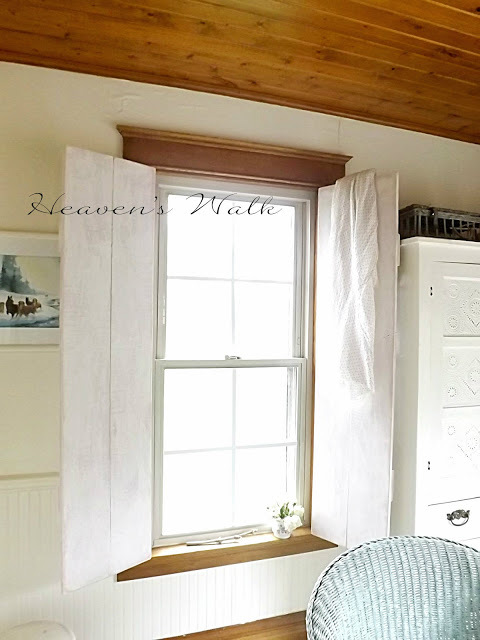 To keep things from looking too sweet, Laurie emphasizes charming farm house elements with rustic DIY projects like these wooden shutters that open to the grassy knoll and lush gardens outside (which you’ll see later). The dining room mantel is decorated with window panes and softened with a few plants. A vintage wicker chair adds additional charm and texture to the space. 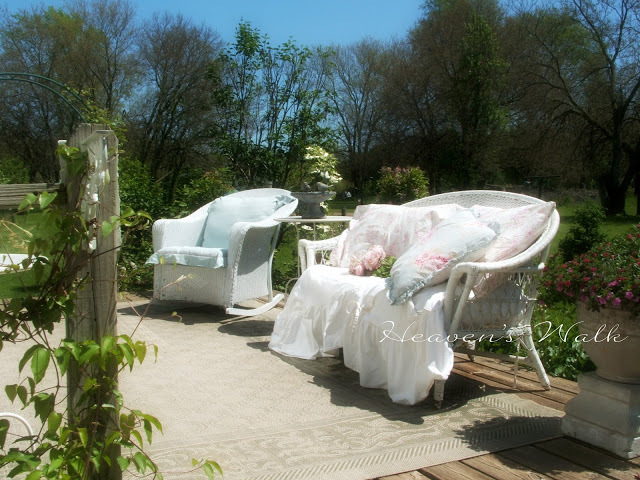 Blue, pink, and white are standard colors in the shabby chic farm house decorating scheme. Laurie beautifully incorporates all 3 throughout her prairie home. Laurie is a truly sweet soul and what I love so much about her charming home is that it’s a true reflection of her spirit. 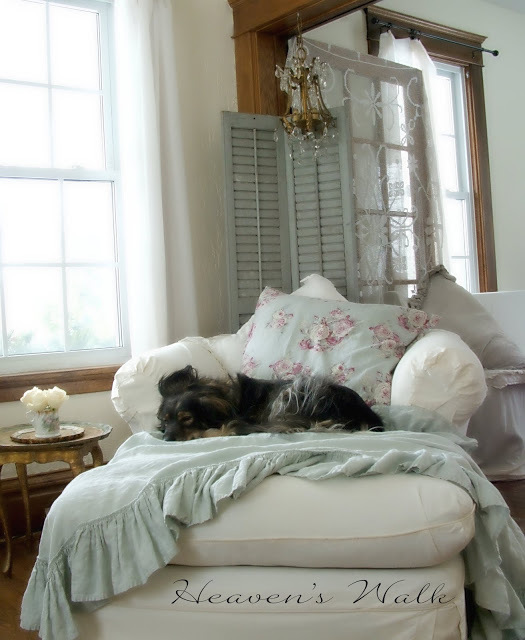 Even puppy gets a pretty place to curl up and take a nap. 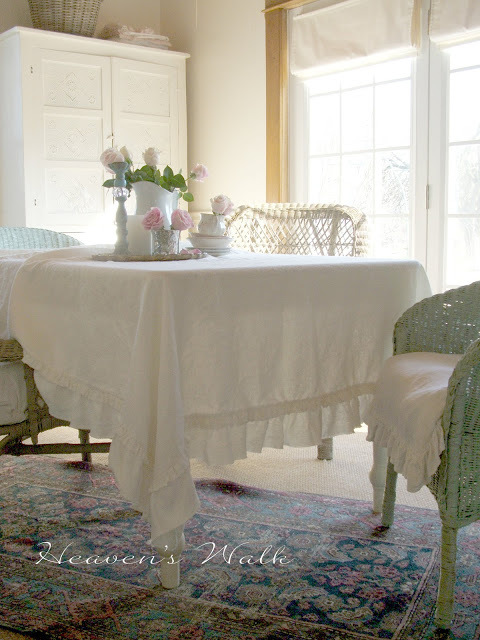 And her linens … oh her gorgeous, gorgeous linens! Aren’t they dreamy? 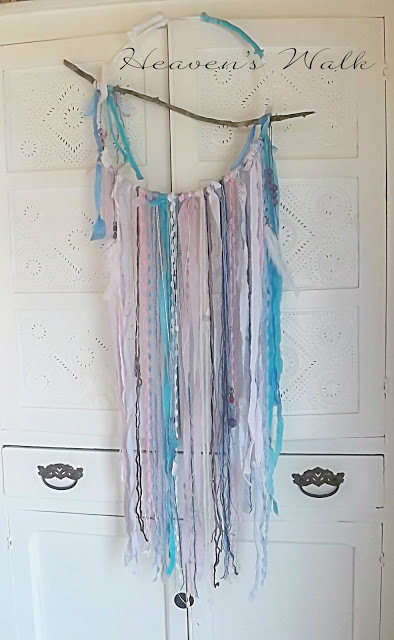 Laurie makes these pretty dream catchers to grace her romantic interiors. As long as we’re talking about dreams, we might as well mosey on upstairs to the bedrooms, filled with shabby chic goodness in the form of ruffles and pink crochet. I don’t imagine Laurie ever has nightmares in this soft, cozy bed. At the other end of the bedroom are big windows you’ll often see in farm houses. They let in plenty of sunlight! The guest room looks like something straight out of a Bed and Breakfast resort. Who wouldn’t want to sleep here? 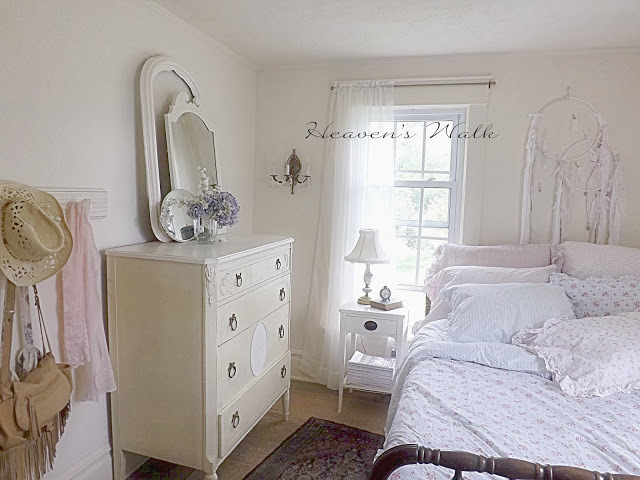 Feminine details create oodles of charm in Laurie’s shabby chic farm house. 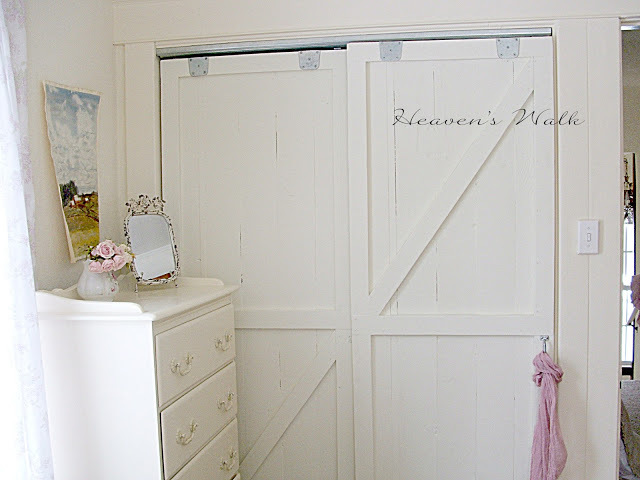 The DIY closet barn doors lend a rustic feel to the guest bedroom. 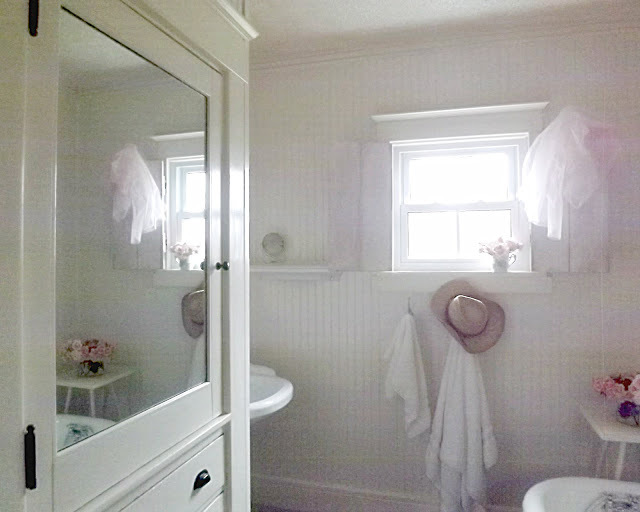 The bathroom is oh so charming with its bead board walls, claw foot tub, and gorgeous built-in cabinet with a mirror! They just don’t make houses like this anymore. 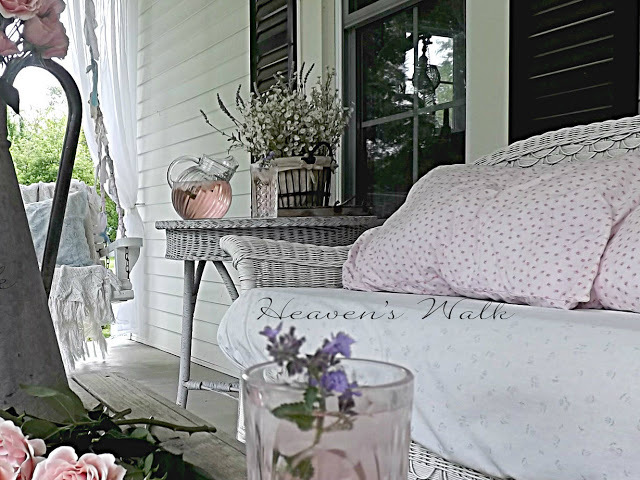 Laurie’s shabby chic romantic style spills outside to the deck. 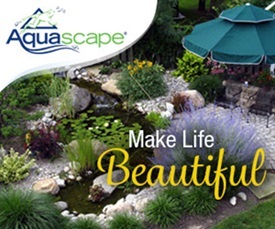 The melodic waterfall spills into the pond while the arbor in the background invites you to explore more of the spacious grounds. 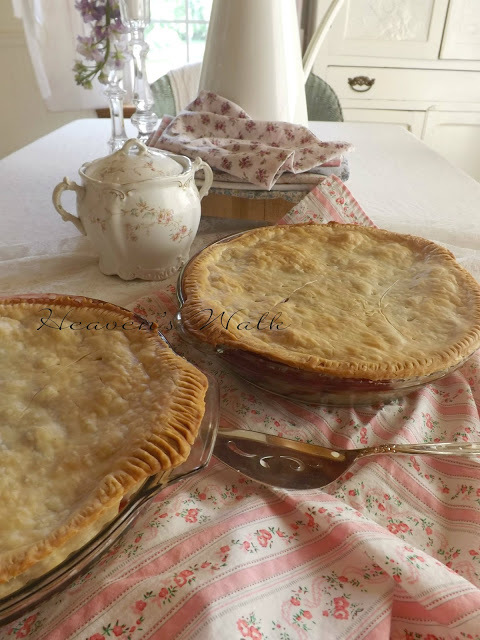 When you visit Laurie’s blog, you’ll see that her landscape is equally pretty in the winter months too. 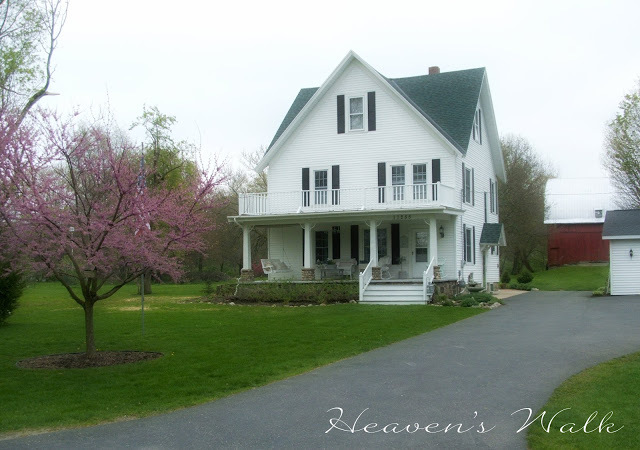 Laurie’s shabby chic farm house makes my heart sing. Her home is full of romance and charm, exuding the grace and sweetness of its owner. 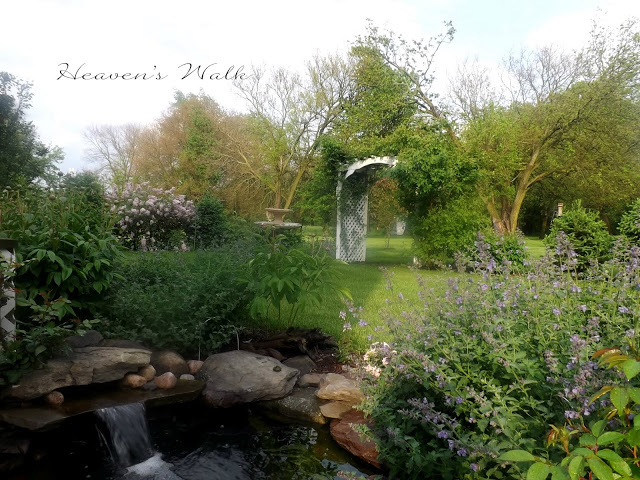 Visit Laurie at Heaven’s Walk and I know you’ll fall in love with her genuine spirit! A special thanks to Laurie for opening her charming home and heart to everyone! If you missed last week’s charming home tour, be sure to visit Dawn’s gorgeous log home! Gorgeous house! Especially love those shutters & the mantel! Laurie has a gorgeous home! 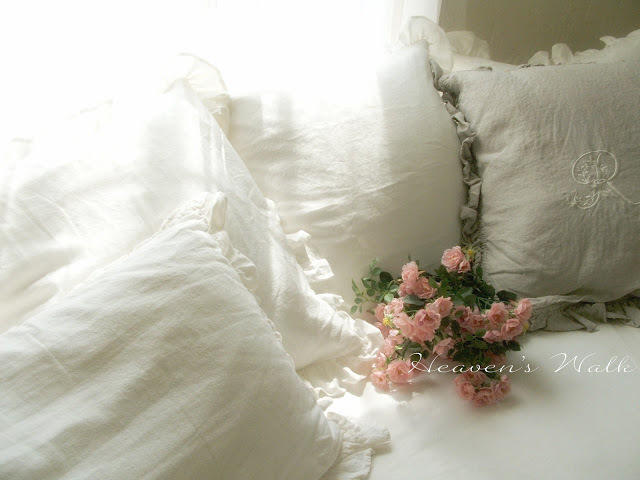 So soft and romantic looking. Even the outside is lovely! Thanks for sharing Laurie’s home, Jennifer! Our homes are often very accurate and personal reflections of ourselves. I agree, Laurie’s sweet personality is all over her lovely home! It’s dreamy. I’ve been reading Laurie’s blog for awhile and it always looks so peaceful and calm in her photos. Such a soft , dreamy , romantic home. I flow Laurie and am always enthralled by her beautiful home. 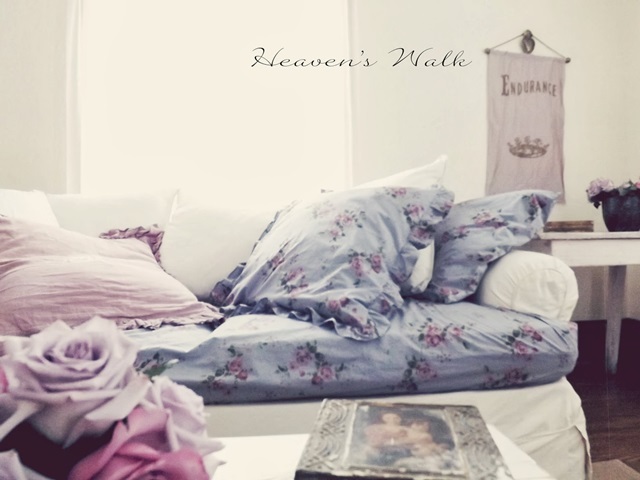 Thank you so much for featuring Heaven’s Walk this week, Jennifer! I feel so honored to have been asked! 🙂 I’m looking forward to visiting the homes that you have planned in future posts! What a great way to meet some new friends! 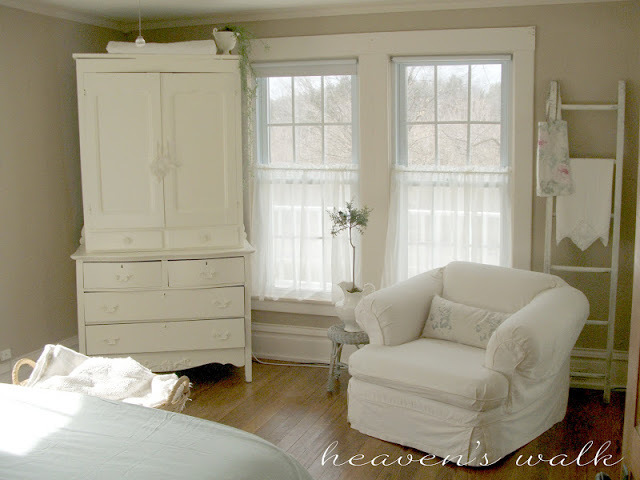 Laurie has such a dreamy romantic style inside and outside her charming farmhouse!! It’s always a treat when we get to visit her home to see her latest project. Laurie has such a lovely sweet spirit…one of those people you wish lived next door. def like stepping into a cloud while enjoying pale pink cotton candy and hearing the choir sing. laurie is a gem and such a sweet multi-talented lady. thanks for spotlighting her place. great rubbin elbows with ya yesterday. Laurie is such a sweet and gentle soul, we go way back. 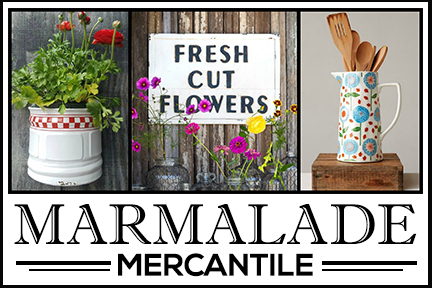 Her love of all things farmhouse and feminine make her home a place we’d all love to make our own! And her gardens! She has been featured in a few magazines. Thanks so much for sharing more beautiful pictures! 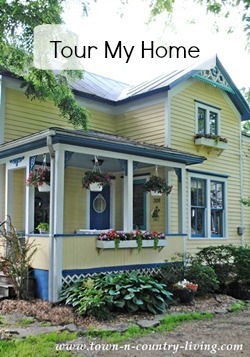 lovely feature, jennifer:) laurie is such a sweetheart and her home is gorgeous! 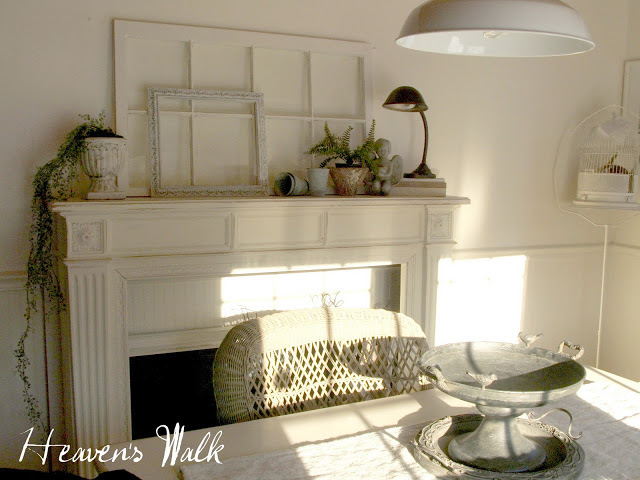 I’ve followed Heaven’s Walk for some time, and Laurie’s home is an absolute dream! Wonderful post, Jennifer! So pretty! 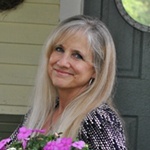 I’m new to Laurie’s blog, I’ll definitely visit. She has such a beautiful home. What a gorgeous cozy country home. LOVE IT! A bit of country feeling with an uptown look. The wooden shutters are ideal for all weather, I really like that. 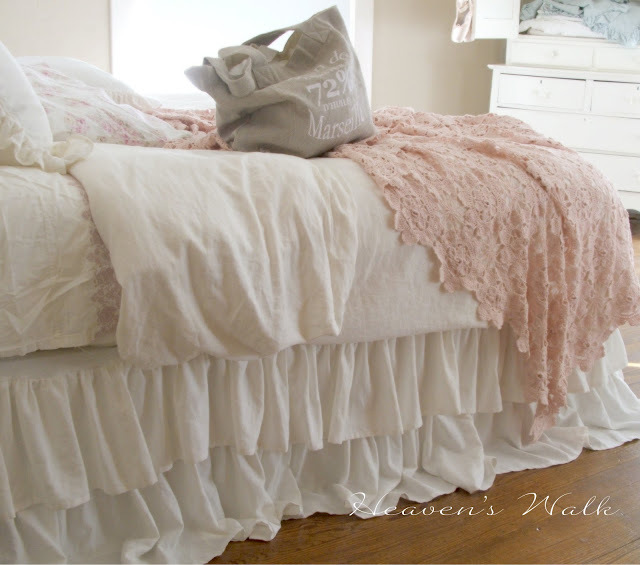 Pink lace and ruffles in the bed room so romantic I’m sure I would forget most of my house whole duties if I lived there. I would just enjoy the beauty.